(Irish: An Clochán, meaning “stepping stones” is a town on the coast of County Galway, Ireland and being Connemara’s largest town, it is often referred to as “the Capital of Connemara”. It is located on the Owenglen River where it flows into Clifden Bay. The town is linked to Galway city by the N59 and is a popular tourist destination for those touring Connemara. 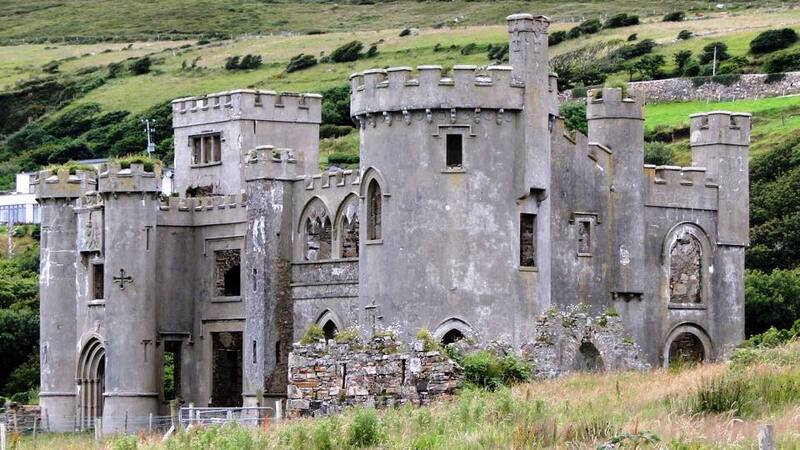 The town was founded at the start of the 19th century by John D’Arcy (1785–1839) who lived in Clifden Castle (built around 1818, now a ruin) west of Clifden. He had inherited the estate in 1804, when it was mostly inhabited by fishermen and farmers. The idea of establishing a town on the coast was first voiced by him in 1812. Bad communications and a lack of private capital prevented fast progress until the 1820s, when the potato crop failed in 1821-22 and D’Arcy petitioned the government in Dublin for assistance. The engineer Alexander Nimmo was sent to the area in 1822. He constructed a quay at Clifden (finished in 1831), and started a road to Galway. With these improvements to its infrastructure, the town began to grow. It prospered until, in 1839, John D’Arcy died. By that time, Clifden had grown from virtually nothing to a town of 185 dwellings, most of them three-floored, two churches, two hotels, three schools, a police barracks, courthouse, a gaol, a distillery and 23 pubs. The population had grown to 1,100 and the town already sported the (as yet unpaved) triangle of streets still visible today. Products that were shipped out from Clifden harbour included marble, corn, fish and kelp. However, John’s son and heir, Hyacinth, lacked his father’s abilities and confrontations with his tenants became commonplace. In 1843, Daniel O’Connell held a ‘Monster Meeting’ at Clifden, attended by a crowd reportedly numbering 100,000, at which he spoke on repeal of the Act of Union. The town’s surging growth and propsperity came to an end when the famine started in 1845. Large numbers of people died, as government help proved insufficient to deal with starvation, scurvy and other diseases. By 1848 90% of the population were on relief (receiving government money). Landlords went bankrupt as rents dried up. Many people emigrated to America. On 18 November 1850, Hyacinth D’Arcy put up his estates for sale and most of them were purchased by Charles and Thomas Eyre of Somerset. Hyacinth pursued a church career and became Rector of Omey and Clifden. Charles Eyre sold his share to his brother, who gave the estates to his nephew (Charles’ son) John Joseph in 1864. In 1855, Sisters of Mercy from Galway came to Clifden and established St. Joseph’s Convent, followed by an orphanage and St. Joseph’s Industrial School in 1858. Clifden is the birthplace of Jon Riley, Saint Patrick’s Battalion’s commander, who fought for Mexico in the Mexican-American War in the 19th century, and John Bamlet Smallman, Irish-Canadian businessman (1849–1916). Clifden gained prominence after 1905 when Guglielmo Marconi decided to build his first high power transatlantic long wave wireless telegraphy station four miles (6 km) south of the town to minimize the distance to its sister station in Glace Bay, Nova Scotia. The first point-to-point fixed wireless service connecting Europe with North America opened for public service with the transmission of 10,000 words on 17 October 1907. At peak times, over 400 people were employed by the Clifden wireless station, among them Jack Phillips, who later died as chief Radio Operator on the Titanic. One 19 June 1919 the first transatlantic flight by Alcock and Brown crashlanded in Derrygimlagh bog, close to Marconi’s transatlantic wireless station. Events that would lead up to the “Burning of Clifden” began on 21 November 1920, Bloody Sunday. On that day, IRA members in Dublin attacked British officers and civilians believed to work for intelligence, killing eleven and wounding four. Later that day, British paramilitary auxiliary forces opened fire at Croke Park, killing twelve and injuring sixty. Thomas Whelan, born in 1899 in Clifden, was arrested and charged with the 21 November murder of Captain G.T. Bagelly. Although he maintained his innocence, Whelan was found guilty and executed on 14 March 1921. Following its Two for one policy that required the killing of two RIC members for every Republican executed, on 16 March 1921 members of the IRA shot and killed Constable Charles Reynolds and Constable Thomas Sweeney at Eddie King’s Corner in Clifden. The RIC requested assistance. In response, in the early hours of St Patrick’s Day, 17 March 1921, a trainload of Black and Tans arrived in town from Galway. They then proceeded to “burn, plunder and murder”. Terrorising the town, they killed one civilian, seriously injured another, burned 14 houses and damaged several others. When the Civil War started in June 1922, Connemara was controlled by the Republicans. Almost all members of The Connemara Flying Column of the War of Independence were on the Anti-Treaty side and some of them became the leaders of the Western Division of the Republican Army. In Clifden, the population tolerated the Republicans but did not support them. The Republicans occupied the barracks on Main Street, the workhouse and Sunnybank, a large house north of town. In addition, all petrol was confiscated, roads barricaded and made impassable, railway bridges were blown up and telegraph lines cut. Newspapers were forbidden. Doctors had trouble caring for their patients due to the breakdown in communications. After the Free State Army took Westport, the Republicans followed a scorched earth policy and burned the buildings they evacuated. In Clifden, the workhouse was burned in July. In addition, on 25 July, the Republicans set fire to the Marconi Station and fired shots at it. This was ostensibly because they considered the station “a British concern”. Another explanation offered later, was that the station had been used by the RIC in their March 1921 call for reinforcements. Transatlantic wireless service formerly provided by the Clifden station was transferred to the more modern Marconi wireless station near Waunfawr, Wales. By one reckoning, the station’s closure following the Republican attack caused an estimated 1,000 people to lose their livelihood. On 12 August, the National Army sent 150 men led by Colonel-Commandant Austin Brennan from Galway by ship. They landed at Kilronan on the Aran islands. After resting, the troops attempted a crossing but just 15 miles from Clifden Quay this was abandoned due to inclement weather. Another try, on 14 August, was successful, with 50 of the troops landing at Mannin Bay, south of Clifden, the remainder travelling on to Inishturk. There they transferred to local fishing boats and crossed to Kingstown Bay, around five miles north of Clifden. In the night of 14/15 August the National Army marched to town from the north and from the south. The southern detachment had previously secured some bridges and the road to the Marconi Station. However, the Republicans managed to retreat in advance of the National Army towards the Twelve Pins and there was only minimal fighting. The National troops were warmly welcomed by the people of Clifden. The Republicans still controlled the mountains and waged a guerrilla war against the National Army, which was unable to dislodge them. The Irregulars attacked Army posts and patrols, mainly by sniping. On 30 September, the Republicans announced that from then on all motor cars in Connemara would be attacked. On 13 October, Republicans burned the Recess Hotel and nearby Glendalough House to the ground to prevent the National troops from using them as billets. On 29 October, the Republicans managed to recapture Clifden from the around 100 National troops stationed there. The attacking force consisted of around 350 men, who came by motor car but mostly by sea. They also had with them an “armoured car”, called The Queen of the West, and made from a ship’s engine boiler plates. This was used to advance towards a defended barracks building in order to drop off mines in front it, thus partly demolishing it. Eventually, the National troops surrendered but they were well-treated and commended on their ‘clean fight’. However, the Republicans – once having expelled the Army – did not occupy the town, which had sustained some damage during the fighting. Communications were once again severed, and the Irregulars took up positions around the town. Finally, on 16 December, the National Army returned to Clifden and the Republicans once again slipped away just before its arrival. The townspeople again welcomed the Army and soon repairs started on bridges and the railway line. Soon the first train in seven months arrived in Clifden.